When Is A Hair Transplant A Good Idea? Hair Transplantation is known under many names. Surgical Hair Restoration, Hair Transplant, Hair Transplant Surgery. Or by the actual technique names STRIP Surgery/”FUT” and Follicular Unit Extraction or “FUE”. Some doctors decide to use their own variant of the name. Offering basically the same techniques with often little to no significant changes to the manner the procedure is performed. The premise of a hair transplant is the redistribution of genetically strong hair. The hair is removed from the “donor site”. The new area the hair is placed is known as the “recipient area”. Not all hair is permanent. Some hair is pre-destined to fall out and not regrow. This may happen rapidly or over the persn´s lifetime. Even with advanced stages of hair loss men retain a band of hair around the sides and the back of their head. Today there are two recognised techniques to harvest the hair from the donor area. STRIP Surgery/FUT and Follicular Unit Extraction/“FUE”. FUT hair transplant surgery the doctor harvests the hair from a thin strip of the hair-bearing tissue. removed from around the back and sides of the head. 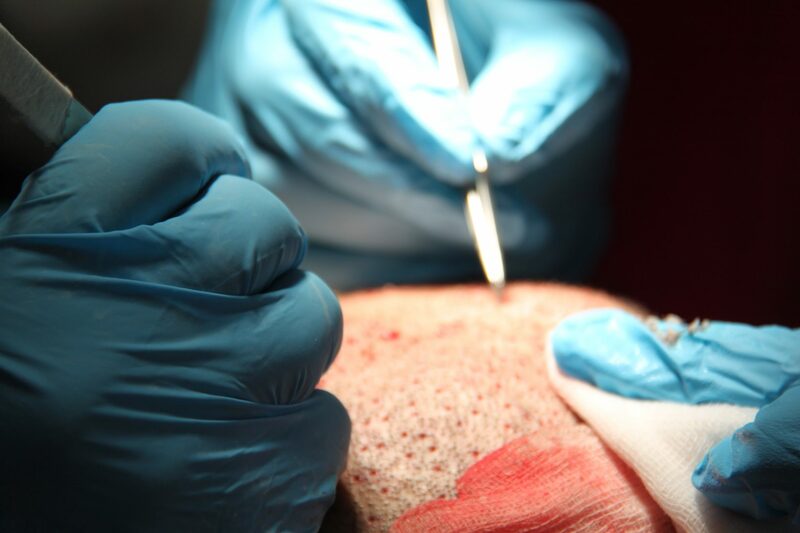 Follicular Unit Extraction/FUE uses a micro punch to extract each follicular unit one by one. With both techniques it has been medically recognised that hair from the donor can be used. This is assuming the donor hair is not suffering from a hair loss condition. Also, the donor hair is removed from a safe area of genetically healthy hair. When moved, this hair will continue to grow after being moved to the new area, displaying the same traits and characteristics as it had prior to being moved. A major evolution in creating a natural look has been the use of natural growing groups of hairs known as Follicular Units or “FU´s”. FU´s contain one to four hairs in each group or bunch. When placed strategically in the recipient area they will mimic a natural appearance of hair growth. Careful alignment of each follicle will ensure they do not overlap and placing them in an asymmetrical manner will help to achieve natural hairline and maximum coverage. As well as a natural looking density from a relatively small amount of hairs. Especially compared to the surface area that needs to be covered in large hair transplant procedures. The techniques from days gone by have been greatly improved upon. As patients have demanded more natural results from surgical procedures the hair transplant techniques have evolved. The Doctor must master the intrinsic art of hairline design and temple closures. Hairline design now is an art, to create the natural irregularities we have. This is opposed to an unnatural sharp obtuse line. Refined placement of FU groupings gives a gradual increase in thickness. The hairline design has to be thought out to frame the individual person‟s face rather than one design suits all. With a greater understanding of anatomy and body proportions, this has aided surgeons to be able to mimic nature. With skills such as recognising angulation, orientation and hair spacing that all play important roles. These medical and artistic skills will determine how the hair will grow in creating a look that is natural. Hair loss can affect men and women. There are many forms of hair loss. The hereditary hair loss condition is called androgenic alopecia. Male Pattern Baldness (MPB) in men and Female Pattern Baldness (FPB) in women. This form of hair loss is passed down genetically from family members. There is a pre destined potential this gene will be inherited by one or more family members. Baldness is a medical condition that affects some 25% of men in their 20‟s and an astounding 2/3 of all men after the age of 60. Predilection to hair loss can occur at any time through our adult life, as early as in our teenage years. Hair loss is progressive and although can be slow once it starts it will generally continue normally following the genetic pat- terning within the family. There are three major types of ethnic hair: Asian, African and Caucasian. People of Asian descent will have a low density of hair, which remains straight along the length. The individual hairs are coarse and will give an appearance of thick hair. Ethnic African hair has the characteristic of irregular curling along the length, which gives high cover- age and the appearance of high density, yet it is of fine di- ameter. Caucasian hair is between these two extremes and shows great variation. People with blonde hair have the highest number of follicles and those with red hair have the fewest, although they will have coarser individual hairs. As an alternative to surgical hair restoration surgery there are medications available that have been FDA (Food & Drug Administration of America) approved. They can help stem the loss of hair and in some cases even improve the growth of the existing hair. Drugs such as minoxidil and finasteride are used widely in the treatment of hair loss prevention. It is important to understand, medically or surgically there is no miracle cure and results will vary from person to person, no one can promise a specific result and it is vital you research the products and techniques available before making any steps to use them. Always seek professional advice before starting a hair loss treatment. Multiple hair loss consultations should be requested especially if considering a surgical hair restoration treatment.